The very exciting new state-of-the-art glass studio is now open at the Chrysler Museum. I have always been a fan of glass art, often purchasing blown glass ornaments and decorations on my travels. For the grand opening of this studio, an expert from Murano, Italy even recently performed and demonstrated his art. I was very excited to try out this skill with an hour-long class at the studio with a friend. We were shown around the Hot Shop and the Cold Shop and the kiln area and given some safety information. Then our instructor gave us a demonstration of what we would be trying. There were 8 students, and after the demo, the lesson became hands-on. We were each given a metal rod, so that we could learn how to properly hold it and turn it while the molten glass was on the tip. Then we each had our turn taking the rod, putting molten glass on the tip, rotating, spinning, heating, trimming, cooling and so forth…Pardon me if I do not have all of the terminology right yet, as this was my first introduction to glassblowing. It was a little scary performing all of the tasks, both in trying to remember all of the steps while the other students were watching, as well as hoping I wouldn’t burn my hands off, set the studio ablaze, fall into the furnace, or singe someone’s feet off. After all, the waivers we signed indicated that there was a remote possibility of death due to glassblowing activities…But we gleefully signed off on our waivers anyway, knowing that glassblowing was bucketlist material. So, each of us nervously had our turn, but everyone stayed safe and was happy with the clear glass marbles that we made and kept as mementos of our initial attempts at glassblowing. My marble has “feet”. I don’t think it’s supposed to. But at least it can stand proudly and remind me of another fun experience I had, getting out of my comfort zone and learning something new. I can’t wait to go back and try something else! 1. I found a fairly large box, roughly 14x18x16. This box can be different sizes, but you don’t want it too small. A roughly square shape is desirable too. 2. I located a roll of rice paper and duct tape. Other materials can be used, such as white tissue paper, light white fabric, etc. I had rice paper sitting in my closet, so that’s what I used. Of course, masking tape can be used instead of duct tape. 3. With the box opening facing me, using an Xacto knife I cut an opening into the left side, right side, and top, leaving about a 2 inch frame around each opening. I was not very particular with measurements – I did this freehand. 4. I cut rice paper large enough to cover the 3 openings. 5. I used duct tape to secure the rice paper over each opening. 6. I cut the cardboard pieces off of the box top (which is the front opening of the photobox), except for the bottom piece. 7. I cut a long piece of rice paper and taped this to the back inside of the photobox. This is used as the white background for photographed objects within the photobox. This piece of rice paper can always be replaced if it develops any wrinkles, stains, or other imperfections, as you will not want to remove these imperfections with Photoshop every time. 8. I am experimenting with various desk/portable lamp combinations. 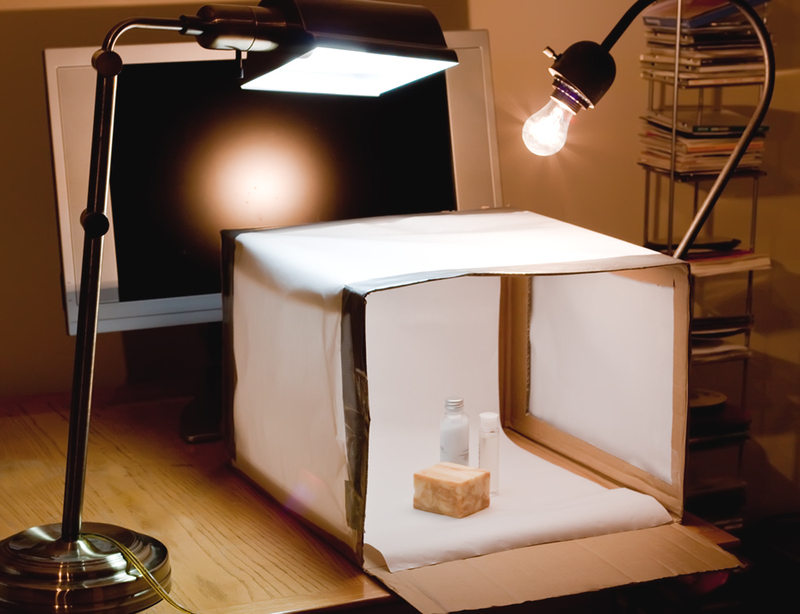 You will need a combination of lights angled from the top and side(s) of the photobox to achieve the lighting that you want. 9. I’ve also learned the trick of placing a square of clear glass (I used a piece of glass from an old picture frame that I wasn’t currently using) on the white rice paper backdrop (the part that extends to the bottom of the photobox). This adds that subtle reflection that is popular in some stock photography. Of course, the addition of this glass is optional, depending on the look you are trying to achieve.